Preheat the oven to 325 and in a bowl, toss flour, salt/pepper and beef pieces. Heat the oil in a large pot (Dutch oven) over medium and (in batches) brown the beef, 8 to 10 minutes. Transfer the beef to a plate. Add the tomato paste, celery, onion, wine, broth, bay leaves and 1Â½ cups of water to the pot. Return the beef to the pot and bring to a boil. Cover and transfer to the oven for 2 hours. Add the turnips (and/or potatoes) and carrots, cover and return to the oven for another 45 to 60 minutes, until the vegetables are tender. 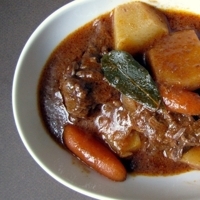 If the stew is too thin, simmer uncovered for 5 to 10 minutes, until thickened. Twenty minutes before the stew is finished, cook the egg noodles according to the package directions and then add salt, butter and parsley. I added these directly to the stew instead of keeping them separate. I also added more salt in the end but do so to your taste of course. Remember to remove the bay leaves. This is also great over mashed potatoes or with crusty bread. 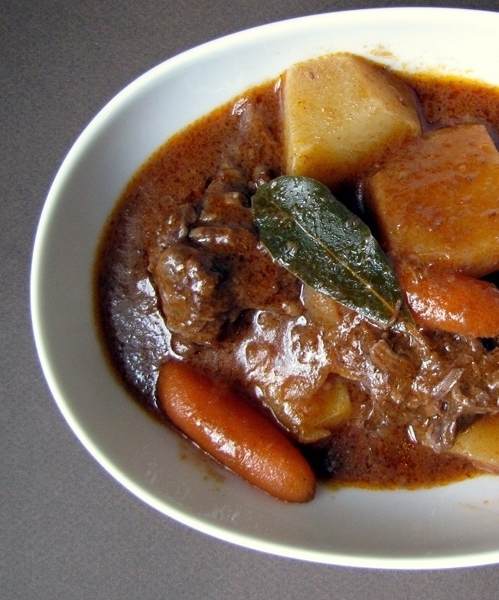 Being French from Bourgogne, I certainly appreciate this great easy recipe! I used quinoa instead of egg noodles and unfortunately didn't use the red wine which definitely changed some of the flavour, but it was still a hearty, basic stew. TROJAN VIRUS AT the gourmondia link above (Anie Stewart) When I went to this site, I got a T R O J A N V I R U S message that my antivirus software detected the virus and blocked it. This recipe looks gorgeous and sounds even better! I enjoyed preparing this cuisine and so excited on the result of its taste. It turned out to be exactly as expected! The menu is quite similar to the above image and tastes so delightful even to my friends. I also like “Blackberry Pork Tenderloin” and “Fried beef fillet with morel mushrooms and Venice balsam” that I've searched at www.gourmandia.net and www.allthemeat.com. You may also take a glance at those sites for more exciting recipes. Enjoy!! Anie, I clicked on your link to gourmandia, and got a trojan virus warning from my antivirus software. What's with the nutritional info? 12000+ calories per serving = 1500 calories per serving? That seems excessive. Thanks for pointing this out Emily. I think the 750 ml is not being parsed correctly, because when I look at the detailed page all of the calories are coming from the wine. I'll get that fixed and then delete this comment.